Lions working together to take down a large Cape buffalo. A well known pack hunter is the gray wolf; humans too can be considered pack hunters. Other pack hunting mammals include chimpanzees, dolphins, lions, dwarf and banded mongooses and spotted hyenas. Avian social predators include the Harris's hawk, butcherbirds, three of four kookaburra species and many helmetshrikes. There are a few cold-blooded pack hunters including simple arthropods such as army ants, the goldsaddle goatfish and occasionally crocodiles. Some non-avian theropod dinosaurs may have displayed pack behaviour. Pack hunting is typically associated with cooperative breeding and its concentration in the Afrotropical Region is a reflection of this. Most pack hunters are found in the southern African savannas, with a notable absence in tropical rainforests and with the exception of the wolf and coyote, higher latitudes. It is thought that either on the ancient and poor soils of the southern African savanna it is not possible for individual predators to find adequate food, or that the environment’s inherent unpredictability due to ENSO or IOD events means that in very bad conditions it will not be possible to raise the young necessary to prevent declining populations from adult mortality. It is also argued that Africa's large area of continuous flat and open country, which was even more extensive while rainforest contracted during glacial periods of the Quaternary, may have helped encourage pack hunting to become much more common than on any other continent. 80-95% of carnivores are solitary and hunt alone; the others including lions, wild dogs, spotted hyenas, chimpanzees, and humans hunt cooperatively, at least some of the time. Cooperative hunting has also been documented in birds of prey and large marine vertebrates such as groupers and moray eels. Cooperative hunting has been linked to the social organization of animal species and the evolution of sociality and thus provides a unique perspective to study group behavior. Understanding how cooperative hunting could evolve requires considering the circumstances that would make it beneficial. A cooperator engages prey both when it is alone or with a companion. A cheater only engages when it is the first to find prey, but lets another individual make the kill if it arrives second. A scavenger never hunts and waits for another individual to make a kill. A solitary avoids others and always hunts alone. Each of these strategies has a certain efficiency based on the size and number of prey that can be captured in a hunt. The model shows that cooperative hunting for a single large prey is an evolutionarily stable strategy (ESS)—a strategy that an individual adopts because failure to do so reduces its fitness—only when solitary hunting is much less efficient. This is usually due to a prey species being too large to be taken down by an individual, meaning hunting efficiency is low and hunting cost is high. In this case, the increased benefit in hunting efficiency from cooperation must compensate for the division of available meat among cooperators. Furthermore, cooperatively hunting groups are prone to invasion by cheaters and scavengers who avoid the drawbacks of hunting, so the added benefit of cooperative hunting must also outweigh these costs. Otherwise, cheating and scavenging can also be evolutionarily stable strategies. The proportion of these strategies increases in larger groups, since only a certain number of individuals are required to help make the kill, allowing others to directly benefit without participating in the hunt. When a species hunts a single prey small enough to be monopolized by an individual, cooperative hunting is rarely ever an ESS since group members are in essence competing for a single meal. Unless individual prey tracking and capture efficiency is extremely low, solitary hunting is always be the dominant strategy since solitaries don't have to share their kill. Cheaters and scavengers never prosper in this situation, since the original captor monopolized all the food. The model predicts that the only way cooperative hunting is an ESS for single small prey is if the predators are already constrained to live in groups—so they must share what they get in order to keep the group stable. On the other hand, cooperative hunting is always an ESS when attacking multiple prey, both large and small. This is because cooperators no longer have to pay costs of dividing meat if they can each make their own kill. Another benefit is that when prey is sufficiently large it can be shared among cooperators if one member was unable to make a kill. Moreover, cheaters and scavengers only do well when hunting costs are very high, since they forgo the chance to get their own prey. In these parts of the model, cooperative hunting is always favorable, as long as there is some form of increase in net efficiency over solitary hunting. However, in their body of research, Packer and Ruttan found very few instances of this clear advantage over solitaries. They concluded that cooperative hunting in multiple prey situations is more likely to be a result of pre-existing social bonds rather than an evolutionary adaptation, but that this hunting behavior is still important for establishing the social fabric of the group. A female chimpanzee must carry her young through the trees, meaning it could be put in danger if she decides to pursue prey. For hunting to evolve, in single individuals the rewards for hunting (meat intake) exceed the costs of hunting (energy used up, injury, illness). For cooperative hunting to evolve, in single hunters the net gain (benefits - costs) of hunting together exceed the net gain of hunting alone. For cooperative hunting to remain stable, there must be some mechanism to prevent cheaters and scavengers from taking an unfair portion of the meat. Following his study of the Taï chimpanzees, Boesch showed that the meat is distributed in a manner proportional to an individual’s contribution to the hunt. This social mechanism is thought to prevent cheaters from destabilizing the cooperative hunting paradigm by getting more than the net benefit of hunters. Additionally, this meat-sharing behavior is not related to the social hierarchy of the group, suggesting that it depends solely on participation in the hunt. Curiously, in female Taï chimpanzees, cheating has become an ESS because there are substantially more costs associated with hunting, including the risk of dropping infants from trees and injuring them. Therefore, it pays females to be a bystander rather than hunt; in fact, the male strategy allows the female strategy to be stable provided the males provision their female partner with food. On the other hand, in the chimpanzees of Gombe Stream National Park in Tanzania, cooperative hunting is not a stable strategy. The predator-prey interactions differ in Gombe chimpanzees in a way that has prevented cooperative hunting from evolving. Both Taï and Gombe chimps hunt small red colobus monkeys that live in trees; however, the trees are much smaller at Gombe such that it is very easy for one chimp to capture its prey. At Taï, the trees are much taller (by about 30–40 meters), and it thus takes a larger effort to capture the prey. This disparity in height would favor the evolution of cooperative hunting at Taï where multiple chimps can help one another out and not at Gombe where the benefits of cooperative hunting do not outweigh the costs of meat-sharing. In fact, single hunters gain much more meat than cooperative hunters in the Gombe population. It is therefore plausible that cooperative hunting evolved at Taï as a response to the more difficult distribution of monkeys in taller trees. The results above suggest that social living in chimps may not be a necessary prerequisite for the evolution of cooperative hunting; instead, the distribution of resources is a critical determining factor. The distribution of prey species is often the determining factor for whether populations hunt cooperatively. When prey is abundant throughout a habitat, cooperative hunting is not an effective strategy. Solitary hunters can easily find food on their own and do not share their kill. This case arises when prey is small enough to be captured by an individual. In contrast, when patches of prey are focused in small areas of a habitat, predators are likely to live in groups to coordinate large attacks and kill more prey. This strategy illustrates the importance of group living in establishing cooperative hunting efforts. In this respect, cooperative hunting is not just a function of the species, but also of its environment. Consequentially, cooperative hunting most likely evolved in areas with scarce prey distribution, and patterns of this behavior are likely to vary with seasonal fluctuation of available resources. Even species that are normally considered solitary hunters have been shown to engage in cooperative hunting when the distribution of prey makes it difficult for solitary hunters to be successful. For example, in aplomado falcons individuals generally hunt alone when searching for insects, as these hunts are simple and these insects are easy to find. However, the aplomado falcons generally hunt cooperatively when targeting smaller rodents and birds, as these hunts are lengthy and require high-speed chases. Thus, the decision to hunt cooperatively is often dependent upon the resource distribution in certain species. When resources are distributed in a way that supports group living, populations may develop social groups. Cooperative hunting is often a major feature of these groups, and it has been theorized that it is a primary basis for the evolution of sociality in the order Carnivora. While alternate theories have concluded that cooperative hunting may not be as important of a factor as territory sharing and mutual protection of offspring, they still agree that it plays an important role in developing social groups. For example, as a result of cooperative hunting, aplomado falcons defend the nest together and share the food with offspring after the hunt. Cooperative hunting has thus proven to hold certain social groups together since it can be disadvantageous to hunt alone in particular situations. Future research may quantify the contribution of cooperative hunting to the evolution of sociality, as it is currently difficult to ascertain how much cooperative hunting is a cause or a consequence of social behavior. When an environment allows it, cooperative hunting can offer species a range of adaptive advantages not normally available through solitary hunting. There are two main goals to cooperative hunting in social carnivores: taking down large prey species through a coordinated effort and subsequently protecting their kill from scavengers. A common goal in cooperatively hunting pairs is to coordinate the separation of a mother and her offspring, facilitating an easier kill that a solitary hunter could not make. Cooperative hunting is also important in species that prey on larger animals, such as African hunting dogs, as it allows them to make a kill in a safer, more efficient manner. After the kill has been made, the hunters restrict meat access to those involved in the hunt to protect their food from scavengers. This includes both strictly scavenging species and members of their own species who do not participate in the hunt. In these ways, cooperative hunting confers adaptive advantages by affording species a means to make more efficient kills and by ensuring they get the maximum amount of food possible from their kill. Another advantage of cooperative hunting is that attacking in a group allows more opportunities to make a kill before the prey scatters and gets away. There is also the potential to confuse the prey species so they may run into another hunter approaching from a different direction. Group attacks are particularly advantageous when prey live in concentrated groups, as hunters have a hard time tracking prey in territories outside the preferred habitat. Higher success in prey capture has been demonstrated in wild dogs, bottlenose dolphins and other cetaceans, falcons, and fossa due to cooperative hunting. For example, aplomado falcons increase their efficiency of capture when hunting in pairs because the pairs are twice as successful as hunting alone. As a result, the high overall success rate of cooperative hunting leads to higher per capita meat intake even in large groups. Many populations capable of forming cooperative hunting groups may not necessarily do so if their group is too small or too large for this behavior to be favorable. Group size is an important indicator of specific instances of cooperative hunting, as the prey must be large enough and the hunting group small enough to provide enough food for all individuals. Another important consideration is that when groups grow larger, there is a greater chance that individuals will engage in a cheater strategy. If there is consistently too much cheating in a group, individuals will prefer to hunt alone so they do not have to share their meal with freeloaders. There may be costs that set an upper limit on group size. The net benefits increase as a function of pack size, as more animals in a group are theoretically able to obtain more meat. However, in African wild dogs, researchers found that the most common group size was not the group size that maximized net benefits. Instead, because larger packs must travel farther to get more food, there are travelling costs associated with larger groups. Thus, African wild dogs optimize a more appropriate currency: the amount of meat gained per dog per kilometer traveled, instead of the amount of meat gained per dog per day as the latter does not take into account the costs of hunting. This research successfully demonstrates that varying ecological variables are responsible for the difference in optimum group size among cooperatively hunting animals. Division of labor, which involves each team member performing a subtask to complete an objective, has been found in many species. It has been shown that animals that forage and hunt cooperatively in groups often adopt specialized roles during a hunting event, which can vary widely among different species. Division of labor among cooperatively hunting species occurs along a continuum, ranging from species in which individuals never differentiate into specific roles to species in which individuals specialize into different roles that they always perform throughout their lifetime. African wild dogs participate in an intense rally ceremony before hunting. Its function is to ensure that all the members are alert and ready to hunt. They then all trot together and participate in a chase during which they pursue and harass the prey. Instead of immediately attacking the prey, which could result in small prey immediately fleeing and large prey forming a defensive pinwheel and charging, the dogs form a defensive formation. Despite their coordinated formation, there is no clear role specialization in this species, as all individuals perform essentially the same function. Co-operation between wolves in a pack is most visible in their hunting strategy, and is highly effective. 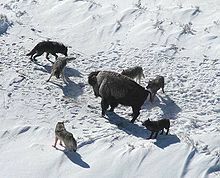 A wolf pack may trail a herd of elk, caribou or other large prey for days, looking for an animal that displays any sign of weakness, before making its move. In open areas, wolves may precede the hunt with group ceremonies involving standing nose-to-nose and wagging their tails. Once concluded, the pack heads towards their prey, chasing it down and then surrounding it. Once the attack begins the wolves have specific roles in the hunt, based on age, gender and social standing, as well as its particular experience and abilities. The youngest wolves frequently do nothing more than observe and learn from the sidelines. Speedy, lightly built females often take on herding roles, darting back and forth in front of prey, causing confusion and preventing escape. Slower but more powerful males are able to take down a large animal more aggressively and quickly. Aplomado falcons monitor each other's movements during hunts. Males and females always perform the same task in every situation. They begin perched together and the males initiate and give a sharp "chirp" vocalization to signal for the female to follow suit. When chasing birds on the ground, the females follow right behind the birds in the bushes and the males swoop in from overhead to make the kill. Within these pairs, males and females are consistently assigned to a particular role. Individual role specialization has also been observed in bottlenose dolphins. The bottlenose dolphins form groups of three to six. One dolphin acts as the “driver” and herds the fish in circles towards the “barrier dolphins” who are tightly grouped together to form a barrier. The driver performs fluke-slaps to cause the fish to leap into the air. As the fish begin to leap, the driver moves next to the barrier dolphins, who all catch the fish in the air with their mouths open. Stefanie Gazda and colleagues predict that this role specialization is more common in marine than terrestrial animals due to a higher variability in prey diversity, biomass, and predator mobility in the ocean. One specific type of cooperative feeding behavior is mud ring feeding. Cooperative hunting strategy in lions is based on groups of three to seven individuals split into two highly specialized roles, centers and wings, which coordinate their movement to encircle and ambush the prey. In a line of lions, the outside individuals, also known as the wings, first run out to the sides of the intended target while the center lies in an ambush position. As the wings slowly encircle their mark, they drive the prey towards the waiting center—often one of the older and heavier individuals in the group—who then pounces to make the kill. Each individual in the group learns its preferred role during youth, whether it be center or wing. A child does not necessarily perform the same position as its mother since it learns through observing other lionesses in the pride. Individuals have also been shown to perform positions other than their natural place depending on whether another individual has already filled their role. Despite this plasticity, hunting success is greatest when every individual in the group can perform its specialized role. In Taï, chimpanzee, individuals participate as a driver, blocker, chaser, or ambusher. Drivers follow the prey without trying to catch up with it. Blockers place themselves in a tree to block the progression of the prey. Chasers move quickly after the prey to catch up with it. Finally, ambushers anticipate the escape route of the prey long enough in advance to force it back towards the chasers or down into the lower canopy. Blocking and ambushing are thought to require much more cognitive effort in anticipating the future movements of the prey, and they are thus rewarded with a larger proportion of meat after a successful hunt. These two roles correlate positively with the age of the chimpanzee as the cognitive function necessary to perform these tasks is thought to increase with age. Furthermore, individuals can change roles during the same hunt or maintain their same role during the entire process. In addition to the well-documented examples of pack hunting in social carnivores, the behaviour is found in both vertebrates and invertebrates. The usually solitary fossa sometimes hunts cooperatively. Fossa (Cryptoprocta ferox) are the first documented example of cooperative hunting in solitary species, as fossa are some of the least social carnivores. The fossa is the largest member of Madagascar mongooses. They are carnivorous, feeding mostly on small lemurs and tenrecs. Prey size may have been important for the evolution of cooperative hunting in fossa because one of their main sources of prey (larger lemurs) has recently gone extinct. Larger lemurs (20-120 pounds), such as giant sloth lemurs, were abundant on Madagascar until 500–1500 years ago. Cooperative hunting was common to take down a prey of this size. However, since extinction was relatively recent, cooperative hunting may have persisted even after their prey size diminished. Stegodyphid spiders (Genus Stegodyphus) have been shown to act cooperatively to trap and collect insect prey species. These social arachnids cooperate both by spinning communal webs on which to catch prey and by moving together to catch large prey in the field, such as grasshoppers. These spiders do not monopolize certain parts of the web, meaning any individual can use a variety of locations to lie in wait for prey. When prey is captured in the field, it usually requires at least two spiders to be brought back to the nest to be shared among the rest of the colony. Research at Lamalera village in Indonesia has shown how cooperative hunting can develop in pre-industrial societies. This village relies on traditional whale hunting techniques for its livelihood. Because whale hunting requires more than one individual, it benefits the villagers to hunt cooperatively. The hunting men cooperate either as crew members, corporate members, or craftsmen. Each performs a different duty and receives a different share of whale meat. Alvard echoes other research by suggesting that these shared norms of meat distribution sustains cooperative hunting and prevents the rise of cheaters. This research also details the importance of biological relatedness amongst a cooperative hunting group. Kin selection favours traits or behaviours that promote the survival of relatives. At Lamalera, only kin that are of the same lineage (that all descend from male relatives or all descend from female relatives) hunt together. The researchers suggest that this allows an unambiguous identification of the relatedness of other group members. Research conducted by Vladmir Dinets has indicated that crocodylians regularly engage in cooperative hunting behavior, including highly-organized game drives. Behaviours noted by Dinets include forming tight "bait balls" when hunting fish and being able to anticipate the location and actions of other crocodiles without being able to see them for an ambush. Dinets suggests this may make crocodiles some of a small group of animals that can cooperate in such sophisticated ways. Groupers (Plectropomus pessuliferus marisrubri) and giant moray eels (Gymnothorax javanicus) provide compelling evidence for interspecific cooperative hunting. Groupers visit moray eels at their resting places and provide visual signals (such as a head shake) to engage morays in the hunt. These associations are non-random and appear to be motivated by the hunger level of the groupers. Groupers were able to capture prey five times more quickly with morays present because the eels could sneak through crevices and corner prey items; additionally, morays that hunted alone were never successful because they did not have a grouper present to lead them to the prey. Thus, the hunting success of groupers and giant moray eels is greater for both species than when hunting alone. ^ Strübin, Carine; Steinegger, Marc; Bshary, Redouan (2011). "On Group Living and Collaborative Hunting in the Yellow Saddle Goatfish (Parupeneus cyclostomus)". Ethology. 117 (11): 961–969. doi:10.1111/j.1439-0310.2011.01966.x. ^ "Cooperative Feeding :: Florida Museum of Natural History". ^ Li, R.; Lockley, M. G.; Makovicky, P. J.; et al. (March 2008). "Behavioral and faunal implications of Early Cretaceous deinonychosaur trackways from China". Naturwissenschaften. 95 (3): 185–191. doi:10.1007/s00114-007-0310-7. PMID 17952398. ^ Liu, Mingwei; Harris, Jerald D.; Norell, Mark A.; Matsukawa, Masaki; Makovicky, Peter J.; Lockley, Martin G.; Li, Rihui. "Behavioral and faunal implications of Early Cretaceous deinonychosaur trackways from China". Naturwissenschaften. 95 (3): 185–191. ^ Mudroch, A.; Richter, U.; Joger, U.; Kosma, R.; Idé, O.; Maga, A. (2011). "Didactyl Tracks of Paravian Theropods (Maniraptora) from the ?Middle Jurassic of Africa". PLoS ONE. 6 (2): e14642. doi:10.1371/journal.pone.0014642. PMC 3038851. PMID 21339816. ^ a b For a brief explanation see Rubenstein, Dustin R.; Lovette, Irby J. (2007). "Temporal Environmental Variability Drives the Evolution of Cooperative Breeding in Birds". Current Biology. 17 (16): 1414–1419. doi:10.1016/j.cub.2007.07.032. PMID 17702577. ^ a b c d e f MacDonald, D. (1983). "The ecology of carnivore social behavior". Nature. 301 (5899): 379–384. doi:10.1038/301379a0. ^ a b Boesch, C. (1994). "Cooperative hunting in wild chimpanzees". Animal Behaviour. 48 (3): 653–667. doi:10.1006/anbe.1994.1285. ^ a b c Alvard M.S. (2003). "Kinship, lineage, and an evolutionary perspective on cooperative hunting groups in Indonesia". Human Nature. 14 (2): 129–163. CiteSeerX 10.1.1.131.5106. doi:10.1007/s12110-003-1001-5. PMID 26190056. ^ a b c d e Hector D.P. (1986). "Cooperative hunting and its relationship to foraging success and prey size in an avian predator". Ethology. 73 (3): 247–257. doi:10.1111/j.1439-0310.1986.tb00915.x. ^ a b c d e f g h i j k Packer C., Ruttan L. (1988). "The evolution of cooperative hunting". The American Naturalist. 132 (2): 159–198. doi:10.1086/284844. ^ a b Creel, S. (1997). "Cooperative hunting and group size: assumptions and currencies". Animal Behaviour. 54 (5): 1319–1324. doi:10.1006/anbe.1997.0481. ^ Haber, Gordon; Holleman, Marybeth (2013). Among wolves : Gordon Haber's insights into Alaska's most misunderstood animal. University of Alaska Press. ISBN 9781602232181. ^ Stander P.E. (1992). "Cooperative hunting in lions: the role of the individual". Behavioral Ecology and Sociobiology. 29 (6): 445–454. doi:10.1007/bf00170175. ^ Boesch C (2002). "Cooperative hunting roles among taï chimpanzees". Human Nature. 13 (1): 27–46. CiteSeerX 10.1.1.556.2265. doi:10.1007/s12110-002-1013-6. PMID 26192594. ^ Ward P.I., Enders M.M. (1985). ""Conflict and Cooperation in the Group Feeding of the Social Spider" Stegodyphus mimosarum". Behavior. 94 (1–2): 167–182. doi:10.1163/156853985x00325. ^ Dinets, V. (2014). "Apparent coordination and collaboration in cooperatively hunting crocodilians". Ethology Ecology & Evolution. 27 (2): 244–250. doi:10.1080/03949370.2014.915432. This page was last edited on 18 February 2019, at 00:02 (UTC).